Planova BioEX's superior filtration performance, combined with its robust virus removability and unrivalled quality, makes it an excellent virus filter choice for your biopharmaceutical products. What is more, we do not just offer the technology, but we support it with science and wealth of experience: our virus filtration experts are always passionate to help you with your process. Explore more how we can work together to maximize the potential of our technology used with your technology. 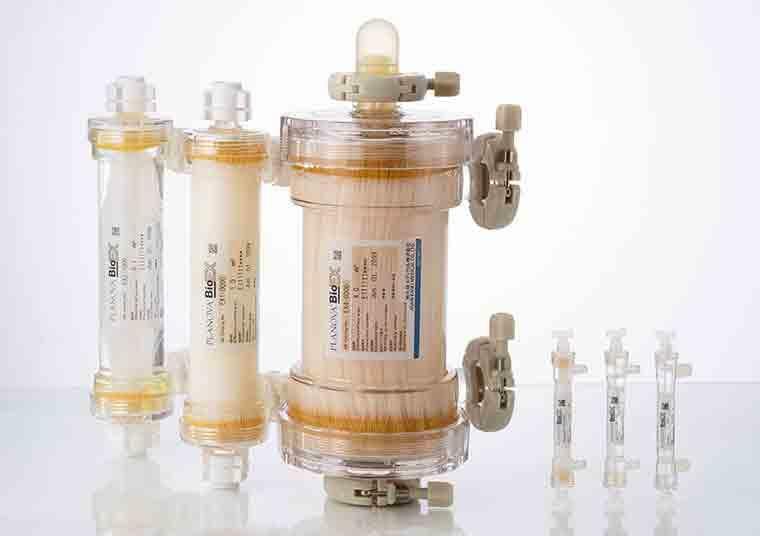 Planova BioEX filters work excellently with various biopharmaceuticals, even with those that are prone to quick fouling. 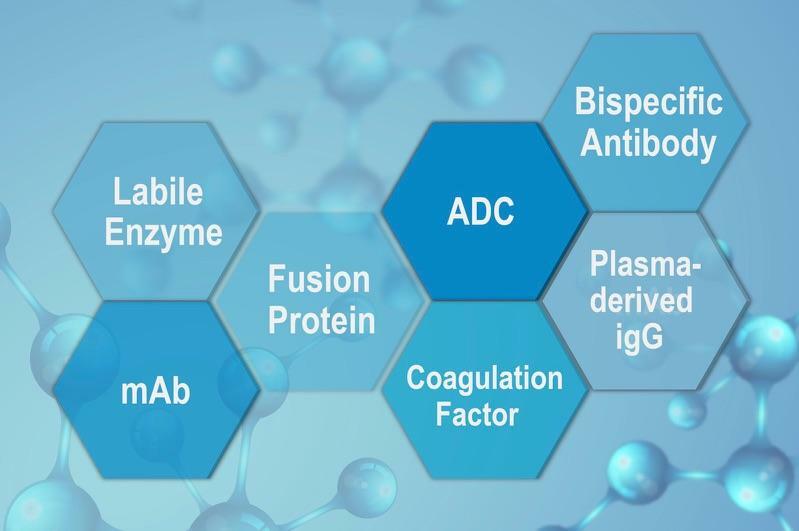 Examples of proteins in which our customers experienced difficulty in filtration include monoclonal antibodies, fusion proteins, bispecific antibodies, antibody-drug conjugates, labile enzymes, recombinant coagulation factors, as well as plasma-derived immunoglobulins. It is the next generation virus filter that you can rely to work with your protein molecules. 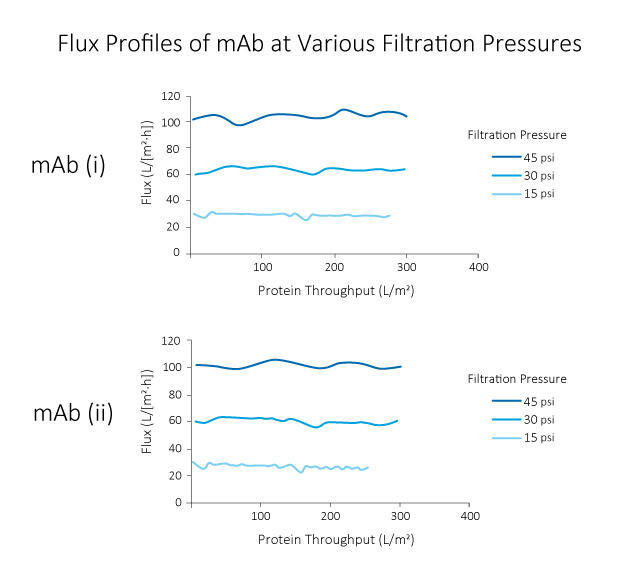 Various evaluations using Planova BioEX, such as those shown in the graphs below, have shown that the filter demonstrate excellent filterability with various molecules considered difficult to filter. This property of Planova BioEX makes it a powerful tool for virus filtration in process development phase of novel proteins. High pressure tolerance of Planova BioEX, contributed by its unique polyvinylidene difluoride (PVDF) membrane, gives the filter a high flux filterability. 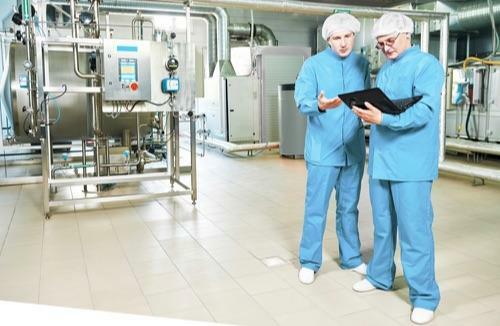 This allows for completion of a virus filtration process within the allowable time frame, typically four to eight hours within one manufacturing shift. 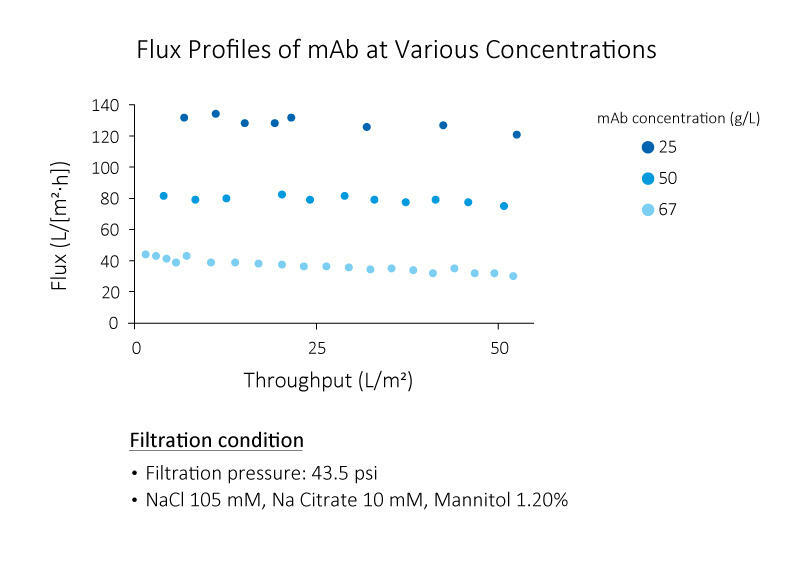 The graph below shows high average flux of Planova BioEX for various monoclonal antibodies at different concentrations and filtered volumes. 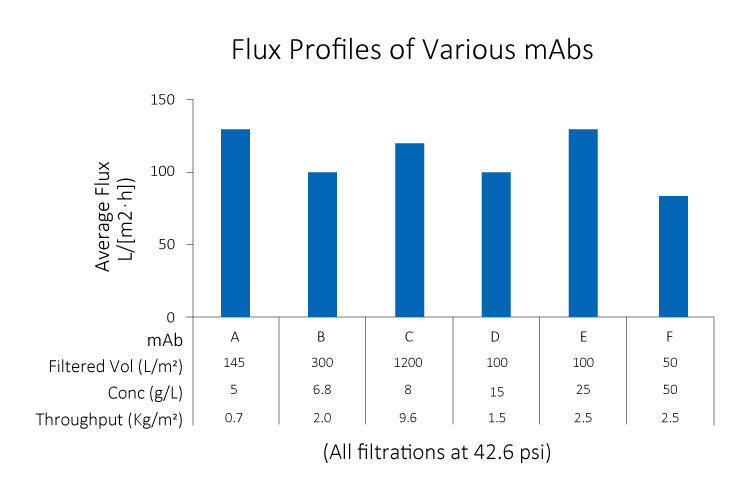 Furthermore, Planova BioEX's performances are shown to be consistent with minimal flux decay throughout filtration runs under various conditions such as high pressure, high concentrations or large volume filtration. 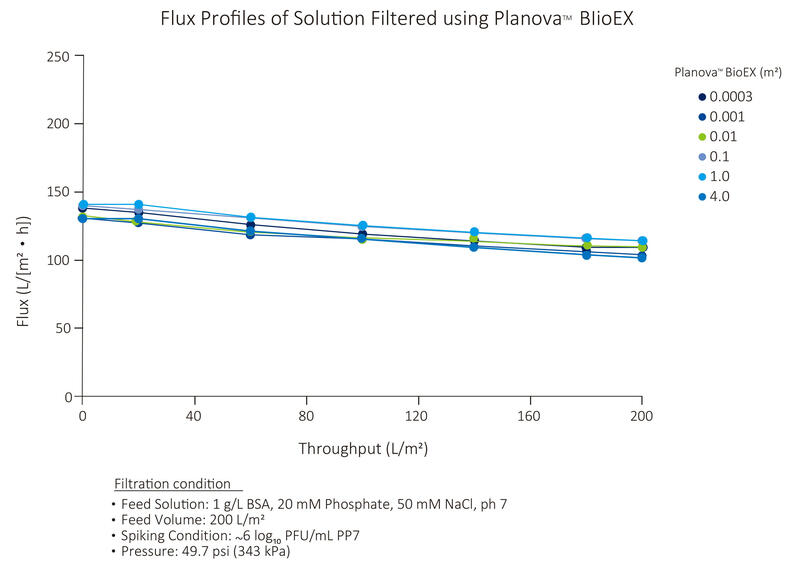 This stable performance of Planova BioEX makes it an efficient and reliable virus filter for each filtration run. For large volume filtration, the high capacity feature of Planova BioEX will allow for less filter surface area needed. 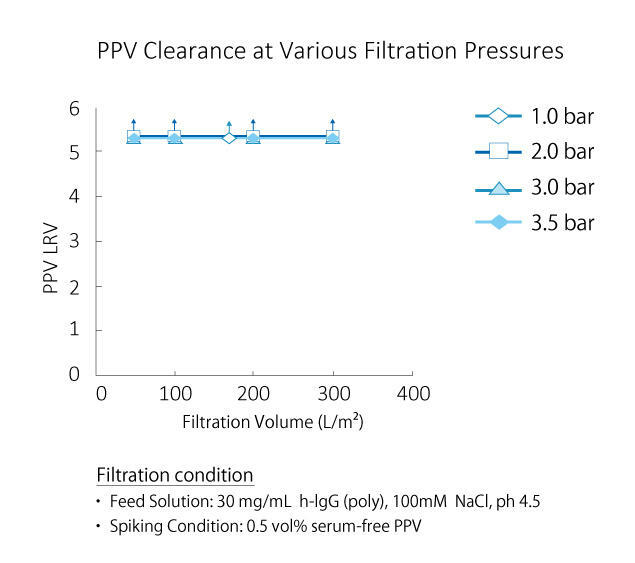 Virus filters are designed to remove viruses from filtered solution, and robust virus filters show high virus removability even under changing filtration conditions. Planova BioEX's thick membrane structure allows trapping of viruses over a large membrane region, making it an efficient virus removal filter. 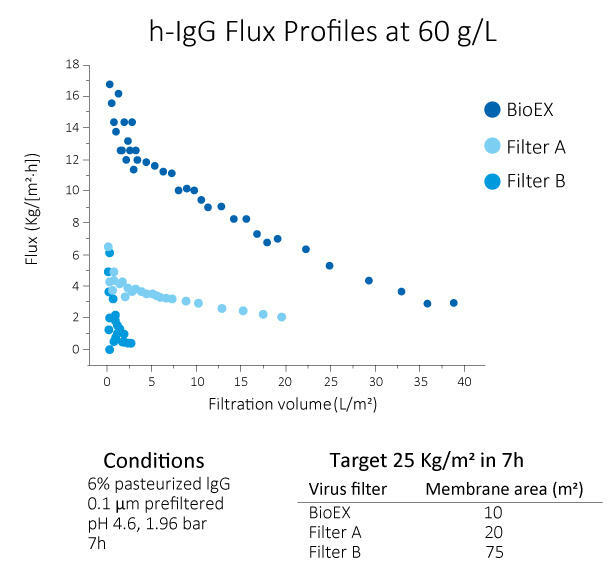 Furthermore, Planova BioEX's robustness allows for consistent virus removability with various molecules, under various conditions, such as different buffer conditions and different filtration pressures. This feature contributes to confidence in viral safety of customers' filtered products. It is necessary for virus filters to have consistent performance from developmental to manufacturing scales, so as to improve the accuracy of scale-up calculation during process development phase. It is also crucial for virus filters to demonstrate consistent performance throughout different lots, so as to prevent unnecessary 'surprises' during development or manufacturing. Designed with hollow fiber membranes and manufactured under a trusworthy Quality Management System, Planova BioEX demonstrate consistent performance regardless of effective surafce area sizes or manuafcturing lots. Customers can have a worry-free scale-up process with our reliable virus filters. 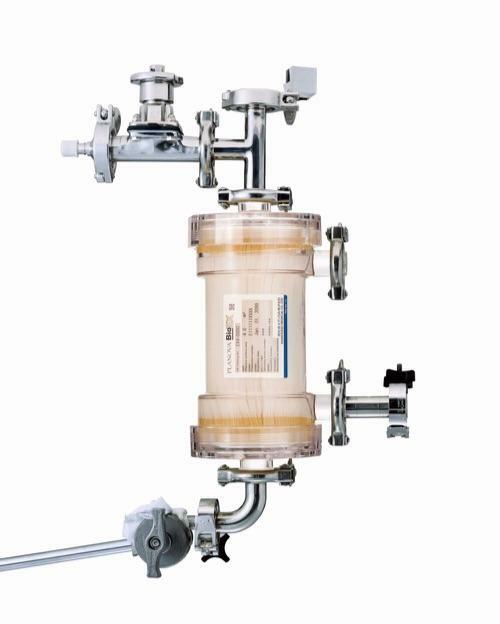 Having unique hollow fiber membranes and filter housing design does not make Planova BioEX a difficult filter to install and operate. The filter's intact module does not require additional stainless steel housing, which minimizes installation error during setup and thereby ensuring virus filtration system integrity. 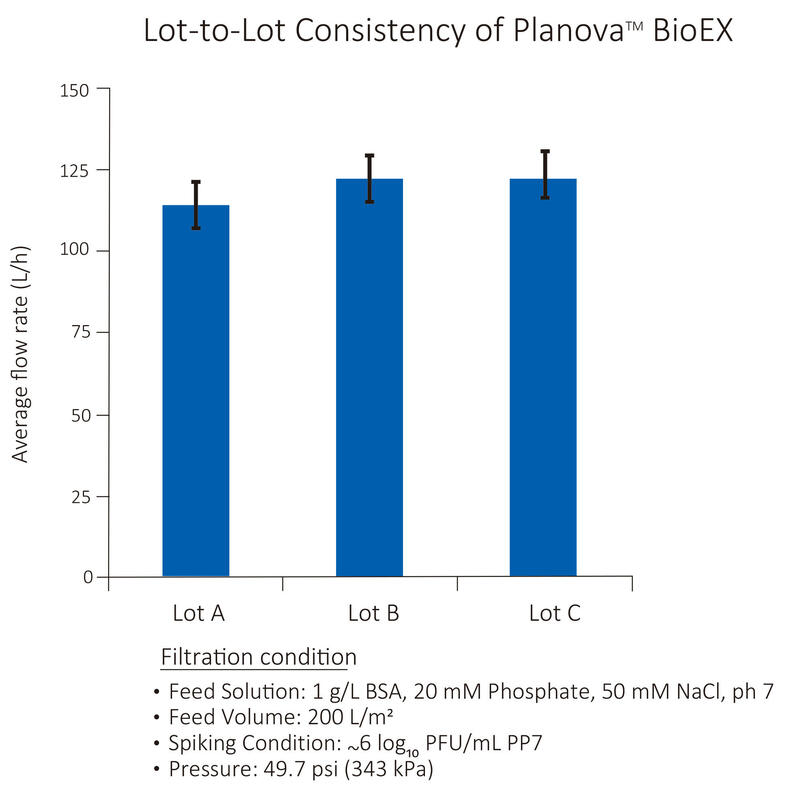 Operating virus filtration with Planova BioEX is simple and worry-free. Each filter is released in wet and sterilized conditions, thereby improving the ease of set-up and preparation that need to be done during operation. Users only need to perform integrity test and flushing (with options to perform in-line SIP and equilibration) prior to product filtration. Not only we provide supporting documentation which can be accessed via the Library Page, our technical support team will provide full support with regards to process design, installation, operation and integrity testing of our products. Various trainig courses are also available to further familiarize users with technical aspects and operation of our filters and their related products. Integrity testing of Planova BioEX is easy with an air-diffusion-based Visual Leakage Test, which is conducted by bubbling obeservation. 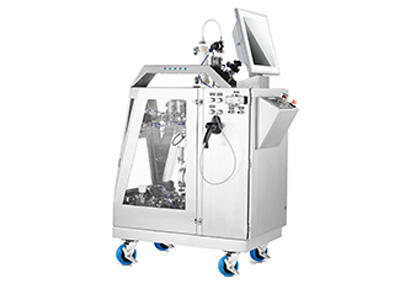 If automation is required, an automated Planova Leak Tester can also be used. The simplicity of the process allows virus filtration with Planova BioEX and its integrity test to be completed within one manufacturing shift for most production cases. 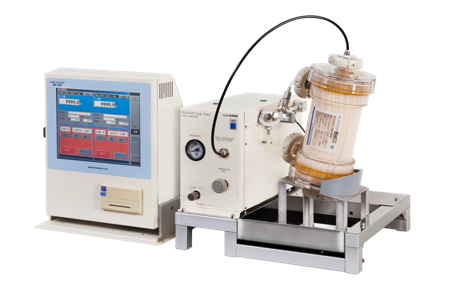 Please visit the Integrity Test Section of this page for more information about Planova BioEX Integrity Test. Integrity test of Planova BioEX is conducted to ensure the integrity of the filter when used in filtration process. 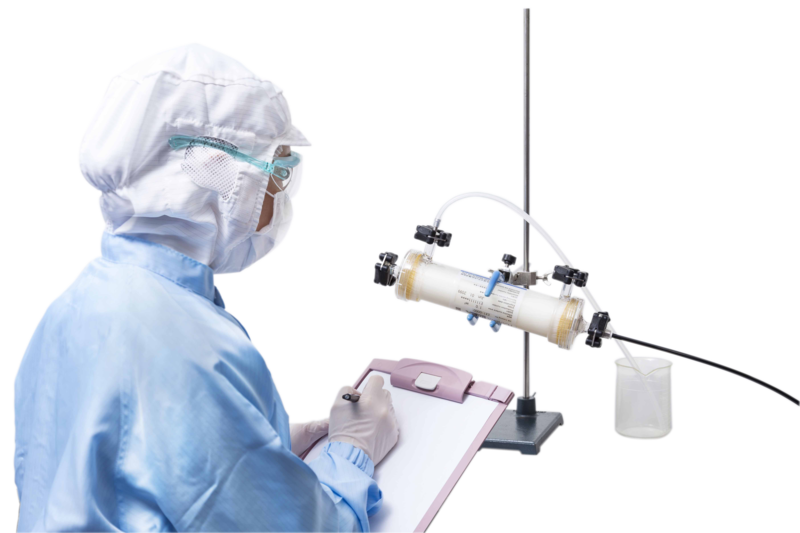 The following qualities allow for a simple user integrity test required to be conducted at the user end: The membrane used in Planova BioEX filters is made of hydrophilic modified polyvinylidene fluoride (PVDF), which provides greater stability and material strength. 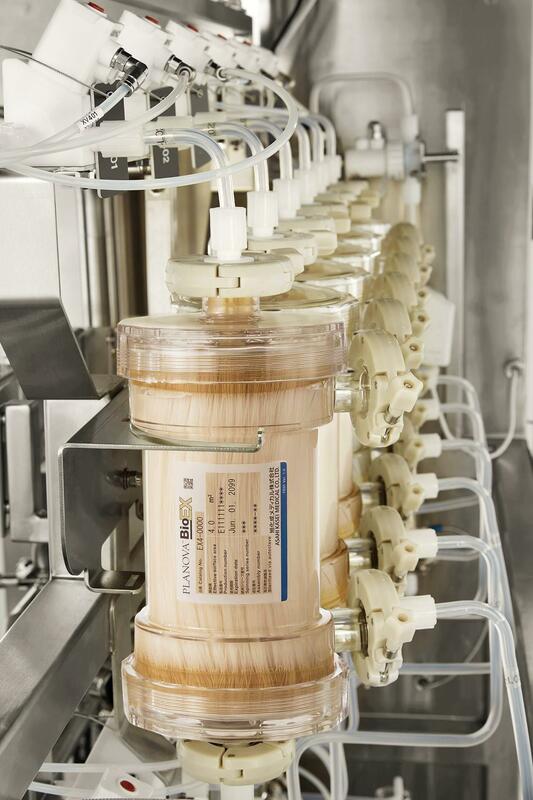 Furthermore, various quality control tests during the production ensure that each hollow fiber membrane of Planova BioEX filters are free from defects, specifically those caused by improper pore size distribution or gross defects in the form of broken fibers or pinholes, which may affect virus removability of the filters. 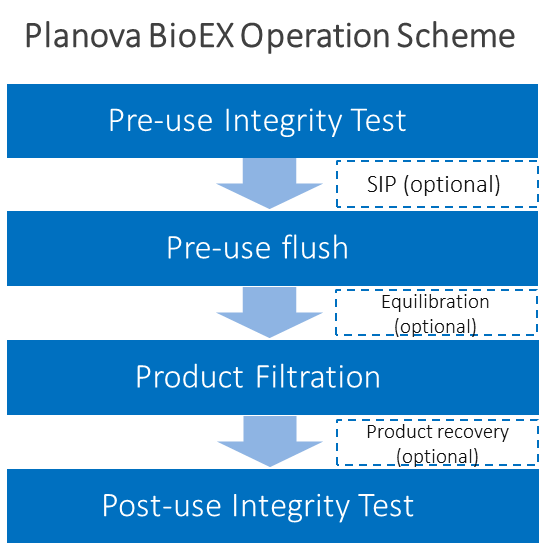 Users are to conduct integrity test for Planova BioEX twice: once before filtration to detect gross defects that may occur during shipment, and another after filtration, to detect defects that may occur during filtration. The integrity test for Planova BioEX is easy with an air-diffusion-based test, which can be performed either manually via visual detection of pressurized air bubbling through the hollow fibers using the Visual Leakage Test method, or automatically via measurement of airflow through the hollow fibers using the Planova Leak Tester (for filters with effective surface area size of 0.1 m2 or larger). The table below lists the catalog number for Planova BioEX virus removal filters. Please contact us and cite the number below to order.